With the use of unmanned aerial vehicles by ISIS militants on the rise in Iraq and Syria, the Pentagon has been aggressively exploring new strategies for dealing with weaponized drones, from hand-held jamming systems to vehicle-borne laser countermeasures. Now, troops downrange are about to add another weapon to their arsenal. U.S. Army combat troops have been training with the “DroneDefender,” a directed-energy rifle that manufacturer Battelle bills as a “non-kinetic solution” to the rise of drone warfare — that is, a solution that lets troops blow drones out of the sky without firing a shot. The DroneDefender deploys an electromagnetic signal to disable communication between an airborne drone and its operator, jamming GPS signals and ISM radio frequencies, a standard feature of most counter-drone technologies examined by the Department of Defense. But in contrast to other handheld weapons like the Block 3 “Dronebuster” the Army’s Rapid Equipping Force recently purchased, the DroneDefender doesn’t necessarily cause a drone to crash, but can “force them to land or hover,” minimizing collateral damage from an airborne IED, notes Army Recognition. In Mary 2016, the departments of Defense and Homeland Security both authorized the purchase of 100 military-grade versions of the DroneDefender for use domestically and downrange overseas, DefenseTech reported at the time. Though a Battelle spokesperson told Defense Tech that drones respond to interference by landing, that's not uniformly true. Some drones, robbed of GPS or commands, will simply hover until their batteries run out. That’s often between ten and twenty minutes even for small commercial models, which is a long time for a guard to aim a radio beam. Though Battelle says DroneDefender has been "successfully tested," the organization makes no explicit claims that it can take active control of a drone. That would be an extremely tall order, given the diversity of drones and control schemes out there. Further, while even high-end drones currently have weak control encryption, the very appearance of tools like the DroneDefender is sure to trigger higher standards. Despite these concerns, the Pentagon seems convinced that the DroneDefender is ready for combat. 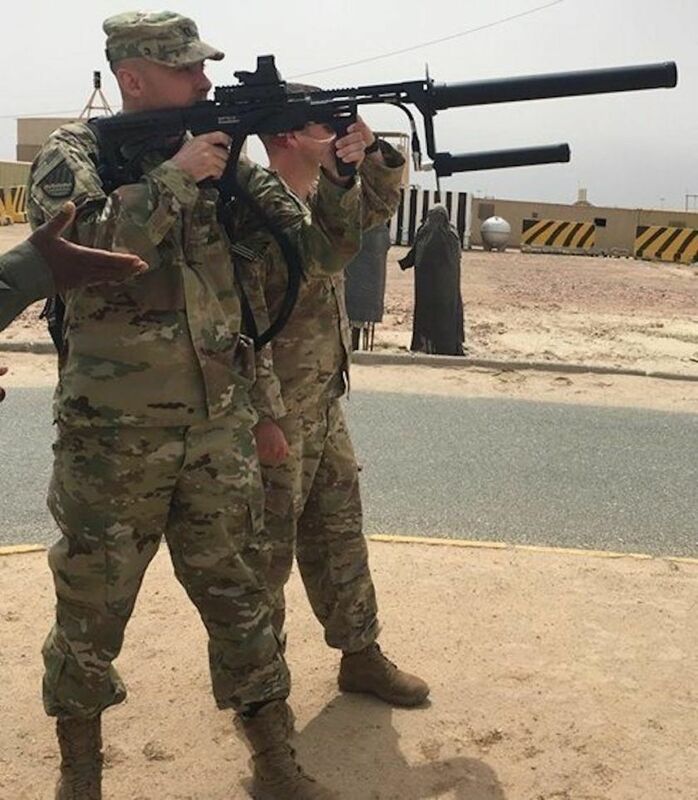 Army Recognition and IHS Jane’s 360 report that troops from the 29th Infantry Division, Virginia Army National Guard, showcased the DroneDefender at a counter-drone tech demonstration at Camp Buehring in Udari, Kuwait on April 6th. "Task Force Spartan personnel took action to counter the threat by familiarizing themselves with a counter-drone technology using inexpensive, airborne, commercially available drones at Camp Buehring," Army officials wrote in a report on the exercise Tuesday, per Jane’s.